I made up my own question today because I had a very cool experience this morning and I want to share it. As I was eating my breakfast at the small lake in central Massachusetts where I am fortunate enough to live during the summer, I heard what I thought was the call of a Common Loon (Gavia immer). I only heard it once, in the distance, and I dismissed it as probably coming from the summer camp at the other end of the lake. “Surely, that was a boy imitating a loon,” I thought. This is a fairly clean and uncrowded lake, and we get a fair amount of wildlife here, including beaver, mink, otter and the occasional osprey or bald eagle. But in 12 years here, I have on only one other occasion heard a loon, and I never actually saw it. And I guess I am predisposed to think 13-year-old-boy-imitating-a-loon instead of actual-loon because when I was a 13 year old boy (Homo sapiens), and my voice was changing, I heard loons up close on a family camping trip in Algonquin Provincial Park in Ontario, Canada. And for about six months or so after that, I was able to use the break in my voice to do a reasonably accurate imitation of a loon’s wavering call. 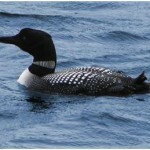 Outside the breeding season, you can often see Common Loons on the eastern shoreline of North America. But during the summer, they tend to be limited to undisturbed northern lakes where they breed. Their call is one of the most reliable sounds of wilderness in North America. So as I sat at my table I was too little convinced that what I was hearing wasn’t a faux-loon to get up and go look. Then, a little while later, I heard the unmistakable splashing, plopping sound of a water bird running along the water trying to take off. Many of the same adaptations that allow loons to chase fish efficiently underwater reduce their ability to fly, so to get off the water and into the air, they often need quite a bit of watery runway. They flap and run and splash and hopefully, they lift off. And that’s what I heard. Now convinced that there was indeed a loon on the lake, I finally roused myself and got into a canoe. 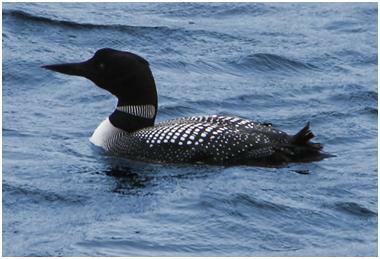 As I paddled along one shore of the lake, I again heard the call, and a quarter of a mile away or so on the other side of the lake, the loon was clearly visible in binoculars. I moved to within about 100 meters (100 yards), but didn’t want to scare the bird away by getting any closer. For ten minutes or so I sat still in the canoe and watched. The loon swam slowly on the surface for a while scanning back and forth, and then began to dive and resurface, each time a little closer to me. Finally, it came up less than 20 feet from my canoe. Then the loon gave that eerie wail of wilderness and I felt very lucky. I doubt this bird will stay. It was alone, without a mate, and was probably looking to see if any other loons were around. 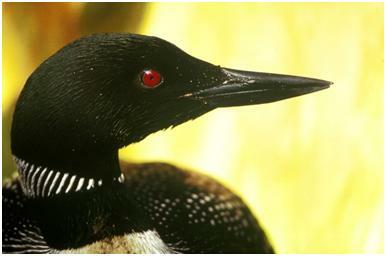 In fact, the wail call it made is a call loons make when they are separated from their mates or chicks. I suspect that once this loon figures out there is no one else out there to return the call – except maybe 13 year old boys – it will move on. There’s probably too much activity on this lake between canoers like me and fisherman and sailboats from the camp to be suitable for loons anyway. But I’m glad the loon was here for a little while, and I’m glad I was able to see and hear it. For a moment this morning, but only for a moment, I wished to be a 13 year old boy with a changing voice again so I could join this bird in expressing life’s occasional loneliness. 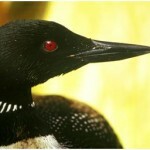 To hear a loon, click here for the Cornell Lab of Ornithology All About Birds site. Cite this article as: Pelletier, TC. (July 17, 2013). A Common Loon or a 13 year old boy? Retrieved from http://askanaturalist.com/how-are-a-13-year-old-boy-and-a-common-loon-alike/ on April 21, 2019. Previous PostThe Great (as in Large) Poop QuestionNext PostHow do all the frogs know I’m coming?